VAN- Minimalist Agency, Photo Gallery Shop Theme Created by Theme-Studio. 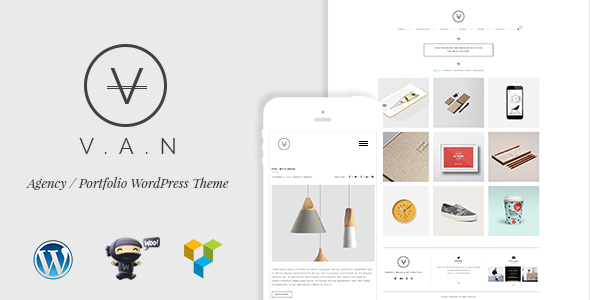 This templates have specific characteristics, namely: VAN is a minimal, clean and modern WordPress Theme for anyone who wants to build an amazing & modern portfolio and wocommerce shop . You can use this VAN- Minimalist Agency, Photo Gallery Shop Theme on WordPress category for design, gallery, grid, illustration, masonry, minimalist, modular, photography, portfolio, product, shop, showcase, van, videography, woocommerce and another uses. Update social widget footer not show custom text and logo bugUpdate portfolio template fix php bug. - Update Visual Composer plugin 4.6.1  - Update Woocommerce plugin. - Fix custom child theme. - New : Auto selecting categories in Portfolio shortcode.- Update latest version VisualComposer plugin.- Update latest version Woocomerce plugin.